Researchers have tried for years to analyze the etymology of the name, Hania, and to decide when the name changed from Kythonia to Hania. The new name is first met as Cania in the document "Sexteriorum Cretensiu in Militias division" in the 1211th So Canea name is mentioned in the document abandon Chania area to Venicians of 1252nd As for the name change from Kythonia to Hania, the most convincing view of Prof. N. Platonas who associated it with the existence of a large village 'Alhania', named after the God Valhanos (Vulcan). Saracens Arabs took the name easier to use, but confused it with their own word "Al Hanim" (Inn). After the departure of the Arabs, the syllable 'Al', presumably to be the Arab article "Al" (it) was dropped because the name was translated into Greek - "Hania" and the Latin 'Canea'. Historical and archae ological, Mound Kasteli is one of the key areas of the city, as it has been inhabited since Neolithic times. The factors which contributed to the continued use of Kasteli as a residential area were: its geographic position and the fertile plain to the south, both of which have contributed to making the area an important commercial and transport junction. Excavations have uncovered remnants from the first Minoan period 2800-2000 BC. The houses of this period are large with well-constructed rooms, walls and floors are painted in a bright red color. Also inhabited in the Post-Minoan period 1580/1550 - 1100 BC. According to evidence on clay tablets in Linear A script found on the hill, the area was reserved for royal use. Between 1380 and 1100 BC it developed into a commercial center in constant communication with the rest of Crete and Greece. A historically significant ceramics workshop, known as' Kythonia Workshop "has also been found in Chania area. It now belongs to the post-royal period. During the so-called historical years, Kythonia seems to have been a powerful city-state, whose domain extended from Hania Bay to the bottom of the White Mountains. Kythonia were constantly at war with other city-states - aptera, Falasarna and Polyrrinia. In 69 BC, defeated the Roman consul Metellus Cointus the Cretans and conquered Kythonia he granted privileges of an independent city state. Kythonia reserved the right to mint its own coins until the 3rd century AD. The Roman conquest put an end to civil wars and a period of peace began, unique in the history of the island. The Kythonia by the historical years was the same size as the city of Chania in the early 20 century. Information on Kythonia of the Christian year is limited. 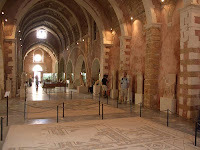 The most important archaeological finds are those of the remnants of a Basilica, discovered recently near the Venetian cathedral in the center of Kasteli. Various sources mention Kythonia Diocese and Bishop Kythonios who participated in the Sardinian Synod in 343rd Kythonia among the 22 largest cities in Crete in the 'Document of Ieroklis' in the 6th century. The Kythonia Diocese is also mentioned in all the "Church Committee Minutes" (normal) before and after the Arab occupation. Occupation of Crete by the Arabs was implemented gradually over the 821 to 824th Implications of the Arabs arrival in Crete were rather painful for the local population who were subjected to a long, horrible period of slavery and resulted in the alienation of Crete from the Byzantine Empire. St. Nicholas Stouthitis was born in 763 in Kythonia, which he left at age 10 to go to Constantinople. In 961, Nikiforos Fokas managed to free Crete and bring it back under control of the Byzantine Empire. The first action of the Byzantine Empire, after re-conquer Crete, was to re-establish their authority and power. Not only were all traces of the Arab occupation removed, the defense of the island was also held fast to avoid any Arab attempt to retake the island. Thus, strong fortifications built along the coast at strategic positions. Kasteli Hill was fortified with a wall along its perimeter. This was constructed with building materials taken from the old city. It is still regarded as a remarkable military accomplishment and a testament to the continued existence of the city between the Arab and the Venetian occupation. After the 4th Crusade and the dismantling of the Byzantine Empire in 1204, Crete has been given to Bonifacio, the Marquis de Monfera. He, in turn, chose to sell it to the Venetians for 100 silver marks. In 1252, the Venetians manage to subdue the local as well as Genoans, which was headed by Count of Malta Henrico Pescatore, seized Crete. Hania was chosen as the seat of the Rector (Administrator General) of the region and flourished as a major shopping center due to soil fertility. Contact with Venice leads to the social, economic and cultural conditions necessary for the development of a culture strongly affected both the Venetian and the local element. The Turks land near the Monastery "Gonia" (Corner) in Kissamos, which they pillage and burn. They seize the fortified island "Agioi Theodori ', and after a two-month siege, the city of Chania August 2, 1645. A new situation that prevails in the city, where churches are turned into mosques and Christian happiness comes at the hands of the conquerors. Turks live mainly in the eastern districts, and Kasteli Splanzia where they convert the Church of St Nicholas of the Dominicans into their central mosque 'Houghiar Tzamissi' (The Sovereign's Mosque). In addition to his Catholic churches into mosques, they build new 'Kioutsouk Hassan Tzamissi' on port. they also build public baths (Hamam) and fountains. In 1821, many Christians have been slaughtered and the Bishop of Kissamos, Melhisethek Thespotakis is hanged in Splantzia. In 1878 signed the Treaty Halepa and the Christians are granted certain rights. In 1898 the semi-autonomous "Cretan State" is established and the city of Hania flourishes as the capital of Crete.